Step 2: Find an amazing photographer like Sara Lleverino. Step 3: Become giddy when you see the AMAZING shots your photographer takes. Step 4: Upload files to spoonflower (at 150 ppi). Step 5: Order 1 yard of Cotton Linen Canvas. Step 6: Buy 1x2x8 wood (or whatever size you want) from Home Depot – Screw together into a rectangle. Mine is about 32×40″. Step 7: “Stretch” the canvas by stapling it to the back of the wood frame. Step 8: Fold the corners over like you’re wrapping a gift and staple. 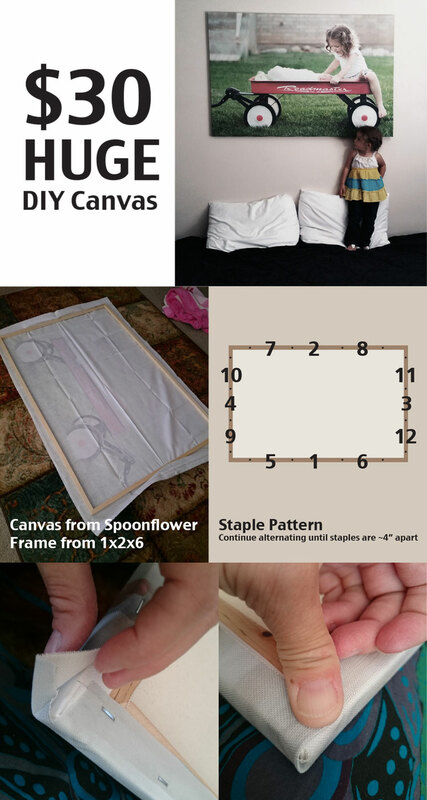 Option C: Buy blank canvas frames from Michaels, stretch new prints over existing canvas.